So of course I came, quickly. The three of us were very intrigued. 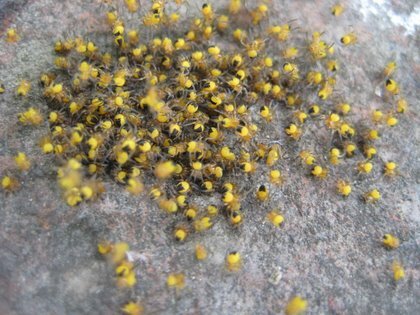 These babies (baby garden spiders, I swear that’s what they’re called) were slightly smaller than sesame seeds. They were congregating on the top of an old well cover. Hundreds of them, I would guess. When scared, they scatter; otherwise, they feel safer clustered together like this. I realize, though, this blog has been heavy on the creepy-crawlies lately. I apologize to the squeamish out there! Wow, that’s impressive. I’ve been seeing spiders all over lately. ‘Tis the season, I guess. I think your child IS being a girly girl by recognizing the wonder of such things as spiders. I know what you mean by girly girl, but it shouldn’t be an insult. I had a six and a half foot tall husband who was afraid of spiders, mice and snakes. My daughter used to tell people that the cartoon character eeking on a chair at the sight of a mouse was her dad…not exactly true, but close. It’s OK if she’s afraid of sharks, though. 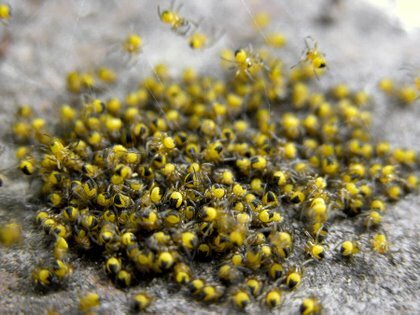 i never thought i would say this but, those are cute spiders! We send them to school and then have to re-plant what gets mixed up in the hodge podge. I think that’s OK. They have a chance to ponder and think for themselves. I never thought I’ll say this, but these spiders are really pretty! I actually find myself scrolling up to have a look again. It’s nice that your daughter loves nature very much. Yeah, they’re cute alright, right now…but wait until they’re about 3 inches long this summer & you accidentally walk into one of their webs in your tomatoes. I get shivers just thinking about that. BB: Yep, they appear to be doing just fine. We make many trips to see them, as you can imagine. 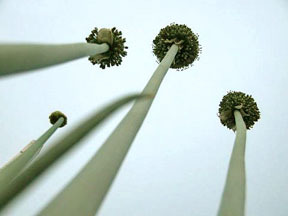 I’m thinking I should scoop some up and relocate them to the garden proper; maybe this weekend if I get around to it. But yeah, Illinois. I am a long way from a pesticide-laden field (at least a mile) so maybe it’s carte blanche for arachnids here? Pamela, that’s just what the hub and I were discussing the other night: that sense of wonder. Too many kid-centered movies IMHO lately are all based on snark and irony and the knowing wink, and almost none of them have awe or wonder as something any character has…or if they do, they’re depicted as a fool. I hopefully am trying to spare her the snark by encouraging the wonder. It’s the least I can do. But your poor hub. I know for some folks fears are very real, even if they seem to be terribly irrational to the rest of us. CC: I’ll spare her the shark with the snark, methinks! Who ISN’T afraid of sharks. I swear I even was timid to go into my good old freshwater Lake Mich. after Jaws came out. Seagrass and Ahyu: they are cute aren’t they? Especially considering how very small they are. Verde, you are quite right: one of my best friend’s theory of parenting is to throw everything at them and see what sticks. Me? I’m more selective than “everything” but I do think exposure is key, even exposure to girly-girls. Artemisia: You bring to mind my favorite sniglet (do you remember those things?) of the image of someone with wildly pinwheeling arms and hands wiping face: that is an arachnidiot. Hah! I remember seeing Garden Spiders in great numbers as a child, but have not seen any as an adult in my own garden. I think they are a good sign! I am new to Alabama and the first time I saw one of those yellow spotted spiders, fast moving, it scared the bejeebers out of me. Scared of spiders! Was bitten by a brown recluse, and what a mess that made of my foot. Anyway, this spider in my yard keeps growing. At times it seems dead, but then it will take off running. I think it has a baby spider ball on the other side of the fence post where I see her. Will they come in my house? Tell me no please! She is interesting, don’t want to harm her ( would probably need a gun! ), but hundreds of babies? No.